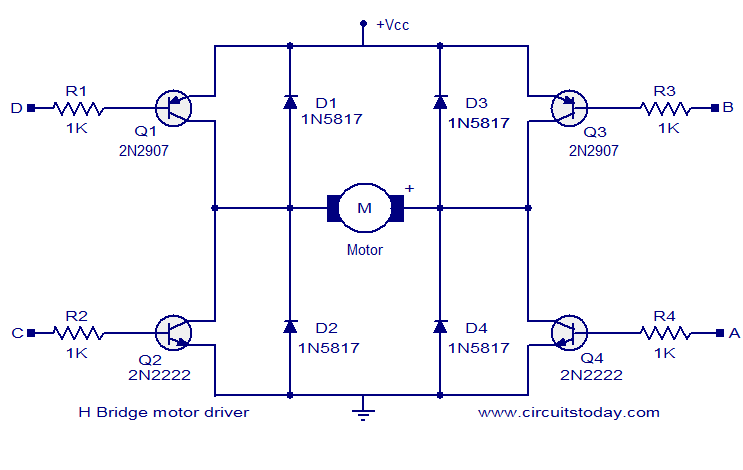 The circuit given here is of a simple H bridge motor driver circuit using easily available components. H Bridge is a very effective method for driving motors and it finds a lot of applications in many electronic projects especially in robotics. The circuit shown here is a typical four transistor H Bridge. The diodes D1 to D4 provide a safer path for the back emf from the motor to dissipate and thus it protects the corresponding bipolar transistors from damage. Resistors R1 to R4 limit the base current of the corresponding transistors. Working of this circuit is very easy to understand. When terminal D is grounded and A is pulled to +Vcc, transistors Q1 and Q4 will be on and current passes through the motor from left to right. When terminal B is grounded and C is pulled to +Vcc, transistors Q3 and Q2 will be on and current passes through the motor from right to right making the motor to rotate in the opposite direction. The maximum possible collector current of 2N2222 is 800mA and that for 2N2907 is 600mA. A DC brush type motor is used here. Do not use a motor that draws more than 600mA of current. 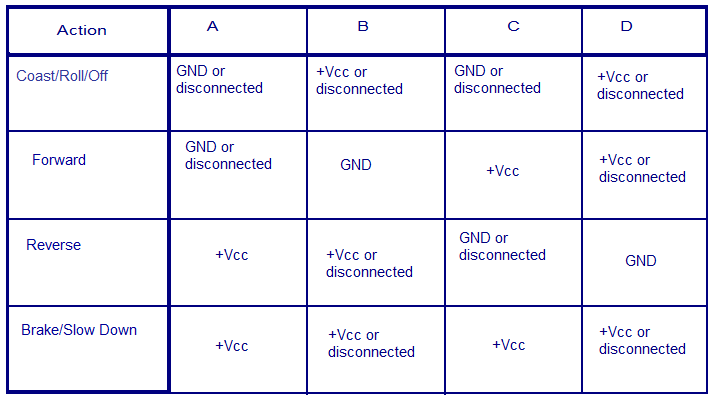 +Vcc can be anything between 3 to 15V DC depending on the voltage rating of the motor used. Do not connect terminal D to ground and C to +Vcc same time, it will result in short circuit. Do not connect terminal B to ground and C to +Vcc same time, it will also result in short. Resistors R1 to R4 limit the base current of the corresponding transistors. By altering their value, you can alter the motor current. How the GSM system works?. In your opinion what are the pros and cons of using an Integrated Dc motor Driver instead of a manual H-bridge Mosfet Drivers? b) 0 or 1 bit: depending on 0 or 1 my moter run in clockwise or anticlockwise . >>> how should i perform this???? hithesh, john and s are right. that was a typing error from my part.Q1 and Q3 should be 2N2907. i have corrected the circuit.sorry for the trouble. any way thanks for pointing the mistake. A little printing error? Should Q1&Q3 not a PNP? May be 2N3xx? Thank you for time and efford in placing this article. The circuit as drawn shows the 2N2222 as being a npn and pnp transistor.